Parents are fully involved in Filial Therapy, and are supported in becoming the catalysts of positive change in their own families. Parents are trained by an experienced therapist who enables them to provide a creative therapeutic process through which their child can safely rework experiences and issues. The therapist helps the parents to think about the child’s play in terms of the insights they can gain about their child’s thoughts and feelings. This helps the parent to understand their child’s motivations, intentions and behaviours in context. As sessions evolve the therapist helps the parent to generalise what they have learned within the sessions to everyday life and parenting situations. Who is Filial Therapy for? This type of family therapy is suitable for children and families with a wide range of presenting issues as the ‘client’ of the therapy is the relationship between the adults and the children rather than an individual within the family. The model is designed to teach and supervise family members to apply knowledge and skills what will help them resolve their problems. Filial Therapy is suitable for one or two parent families, with children aged between 3 and 12 years old. In two parent families, both parents are encouraged to take part in the training so they can both carry out play sessions at home with their children. Filial Therapy can be used as a treatment for child and family problems, as well as a family enhancement intervention. Because it focuses on the positive aspects of what parents can do with children it is particularly beneficial for addressing difficulties associated with parental challenges and in this way contributes to the development of positive attachments as a whole. What happens in Filial Therapy? 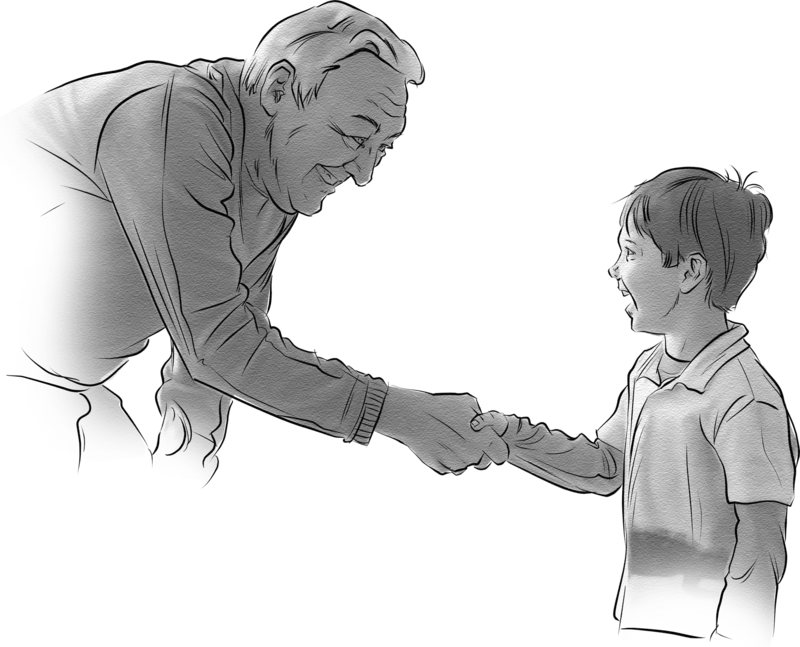 In the initial assessment phase the therapist spends time with the parents/carers eliciting the their reasons for seeking support, obtaining a family and social history, and working to identify some goals and desired outcomes from the intervention. Confidentiality is discussed and an explanation of the process given. The therapist then carries out a family play observation in which they gather information on the interactions between family members. This is then discussed with the parents in terms of how typical the interactions were and how behaviours exhibited resemble those at home or in other settings. The therapist will then give any initial recommendations, relating them to the goals identified in the assessment process. Following this the training section of the intervention takes place in which the therapist trains the parents in the four basic skills of: structuring, empathic listening, child-centred imaginative play and limit setting. These skills will be practiced in mock play sessions. Play sessions between the parent and child begin when the parents are ready (usually after 3 or 4 mock sessions). 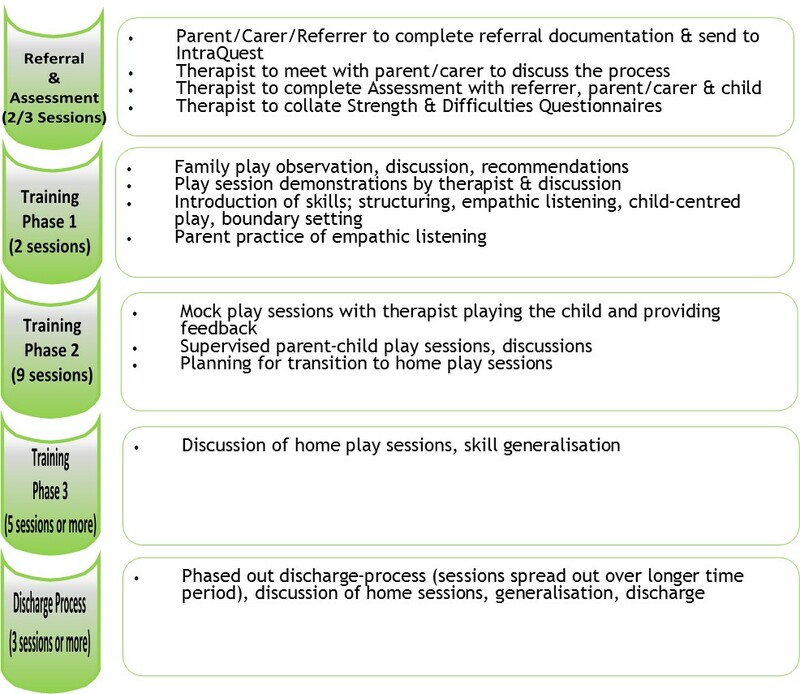 Initially these take place in the presence of the therapist who observes and supports and gives feedback to the parent directly after the play session. Play sessions are transferred to the home when the parent is confident to do so and the discussion and feedback takes place at a meeting between the parent and therapist at a scheduled time and place (not the home). There is a phased out discharge process in which feedback and support sessions are gradually spread over a longer time span. This occurs as a generalisation of the skills is noted outside of the session times and in day to day life. Generally a Filial Therapy intervention lasts around 20 weeks. Sessions can continue to take place for as long as is deemed useful by family and therapist. We work in line with the BAPT code of ethics and in line with current child protection legislation, therefore we will never keep information to ourselves where we believe a individual we are working with is at risk. Where young people are working with other agencies, we will always encourage appropriate information sharing, in order that therapy compliments any other care plans in place. Consent for this must be given by the client before contact is made. As with all therapies our therapists will have regular supervision whereby their interaction with clients will be discussed. This will enhance their understanding of their clients needs. All documentation regarding your child will be kept safe in a locked cabinet. If you would like to know more, or book a free consultation, please contact us or complete our referral form.